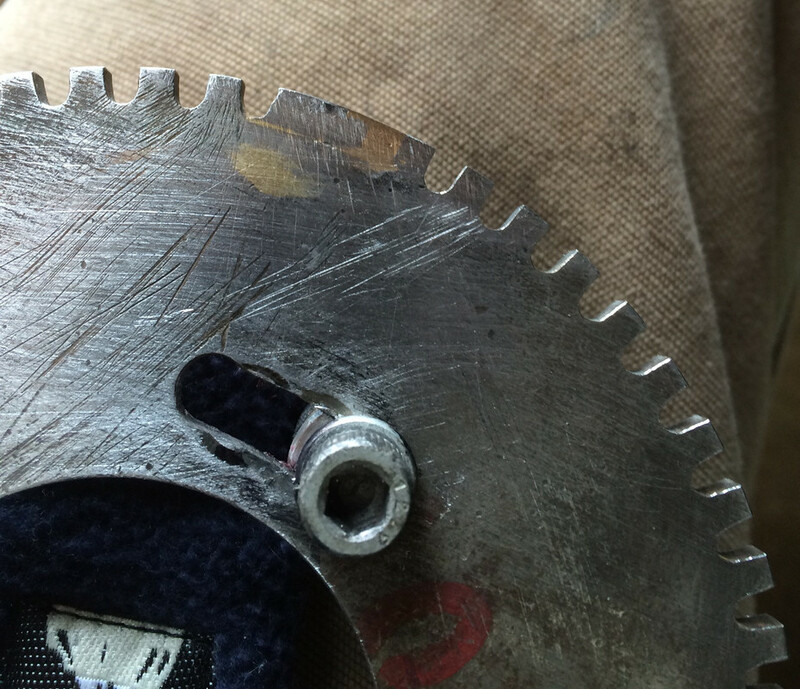 The flywheel has 57 + 1 long tooth. Yes. Or rather, it has 58 holes and two missing holes. Which is the same as 57 teeth and one long tooth. The point being that for this to work, you need a 60-2 -type of a trigger wheel. The ECU is expecting 58 peaks from the signal and a flat sport. It appears that you have 59 teeth in total, meaning that you have 58 teeth + 1 long tooth. That would be wrong. This is a 60-2 trigger wheel. It has 58 actual teeth and 2 missing teeth. 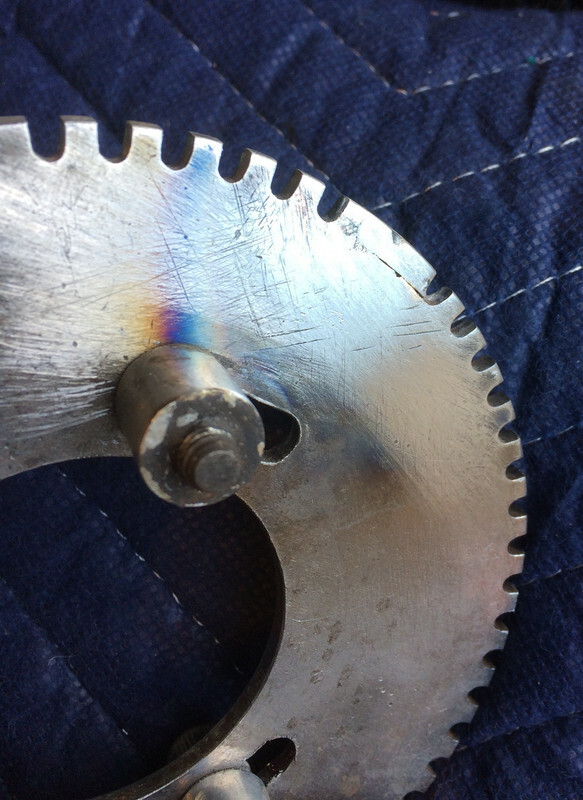 And this is a 60-2 trigger wheel as well. It has 58 actual holes and 2 missing holes. Both of those give essentialy the same signal. Only the signals are mirror images of one another. That is, if the sensor wires are not switched over. If you count the holes you have 59 actual holes and 1 missing hole. That is if you modified your trigger wheel as shown above. 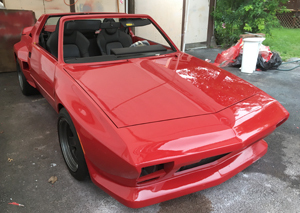 It's difficult to tell from your pictures how exactly you did modify it. The signal from that modified one will not be similar to the stock L2.4 flywheel. Edit - didn't see Wagner's post - OK, so I need to lenghten the fill in. Last edited by lookforjoe; 04-03-2016 at 09:23 AM.. So the problem is by adding two teeth with one gap eliminated I only filled in 9º, where each count should be 6º (tooth/gap), so by filling in the leading gap I will increase the radial count to 15º (three teeth/two gaps). Last edited by lookforjoe; 04-05-2016 at 10:33 PM..
Glad it helped, and here's to hoping that fixing the trigger wheel will get this thing running! There is a slight chance that the signal level is too low, but only trying it out will tell. Usually a smaller and a thinner wheel will give a lower signal with the same sensor than a bigger and thicker wheel. In this case you have the stock Volvo sensor, which is originally used with a big and thick wheel (flywheel). If that is the case, bringing the sensor as close as possible to the wheel will strengthen the signal. Or a different sensor could be tried. Ford sensors usually give a higher voltage than the stock Volvo one. But it really depends on how the ECU is setup to handle the signal, so it could also be that it will work with the stock sensor. I don't know if I need to set the TDC reference point (90degree) in the gap after 90, or on the tooth at 90 - I have it pretty much in the gap as it is. Since I have an adjustable distributor, I tried playing with that without any success . With all this cranking, the batt voltage may now be dropping too low for the system to function - goes down around 10v - so I've left it on a charger right now. I do now have voltage at the fuel pump feed off the system relay when cranking, and code 141, which according to my guide means valid pulse signal. Don't know if that confirms anything in terms of timing though. With a test light on the coil, I don't have a steady pulse on the negative side , which is also comfusing. Last edited by lookforjoe; 06-02-2018 at 09:19 PM..
What did you fill it with? It needs to be magnetic steel (or iron) for the VR sensor to read it properly. EDIT - do you have an opinion on the placement in terms of gap / tooth @ 90 degree mark? Last edited by lookforjoe; 04-02-2016 at 03:42 PM..
One other question is where the rotor should align @ TDC - centered or on the leading edge of the rotor tip? Last edited by lookforjoe; 05-31-2018 at 08:27 PM..
Ok - after charging the battery awhile, and determining that if the engine stalls, the key has to be cycled (I was using a remote start) in order to reset the system relay. The engine now starts (very short crank time), but won't stay running for long & it still feels like the timing is off, turns slow like too much advance. It ran long enough for me to use a timing light & confirm the base timing is running at 12ºBTDC, so I'm not sure why it's 'lugging'. 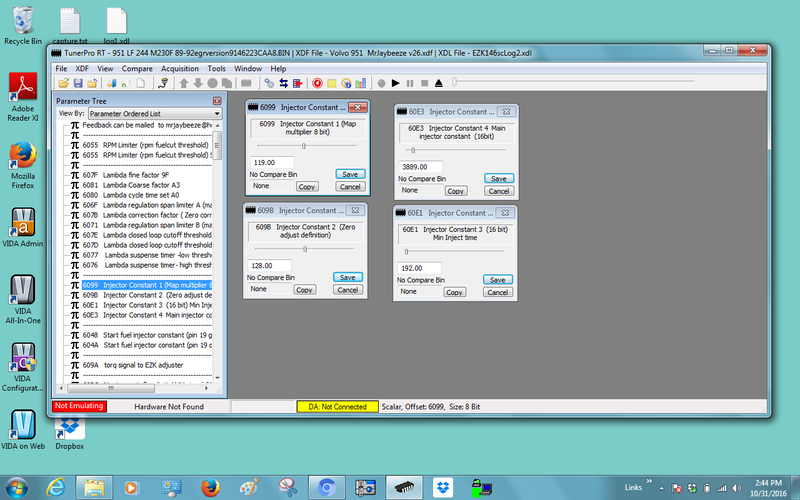 Since it does start, I'll go through the diagnostics & see what codes I come up with. 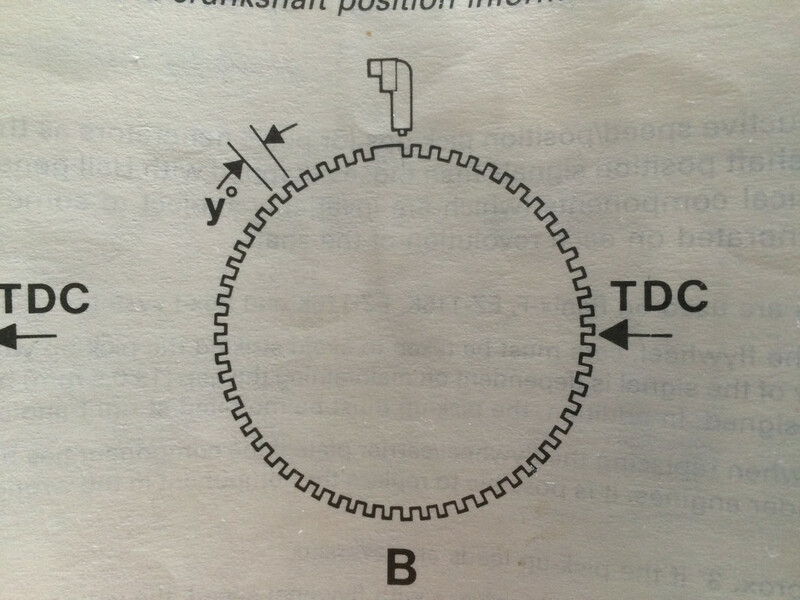 I don't know if the trigger wheel is accurately set in terms of relationship to TDC, although if it were not, I would think the system would not properly set the 12º base timing? I also don't know what the proper distributor rotor setting is for LH2.4, relative to TDC. 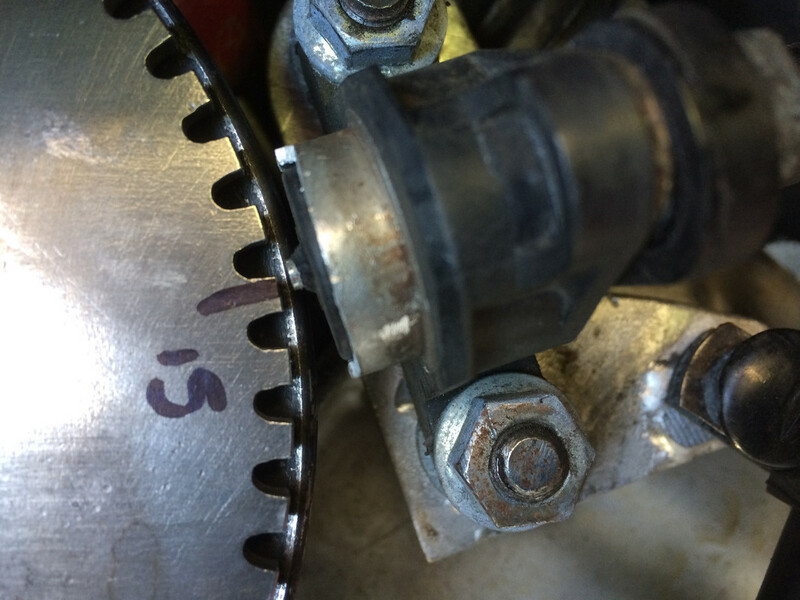 If anyone has a pic of the flywheel w/ sensor @ TDC, and of the correct rotor position, I would appreciate the input. Last edited by lookforjoe; 04-02-2016 at 09:27 PM.. I don't have a picture handy, but the thing that matters on rotor positioning is that the rotor is pointing to the correct cylinder's spark plug lead at all ignition advance values. I'm not sure of the maximum advance either on a B230F, but it's most likely in the region of 30-40 degrees of advance, and most likely not more than 40 in any case. So you could make a distributor cap with a hole in it so that you can look inside it. Turn the engine to compression stroke TDC of cyl. number 1 and verify that the rotor is pointing to cyl. 1 spark plug lead. Actually this would be 0 degrees of advance, which would not occur in use, so in this position it does not have to be exactly at cyl 1 position, but very near none the less. Then turn the engine backwards 40 degrees and verify that the rotor is still pointing to cyl. 1 spark plug lead, and that it's close enough for the spark to jump. EDIT: You could probably still bring the sensor closer to the wheel. And is the trigger wheel co-centric with the crank shaft, I.E. 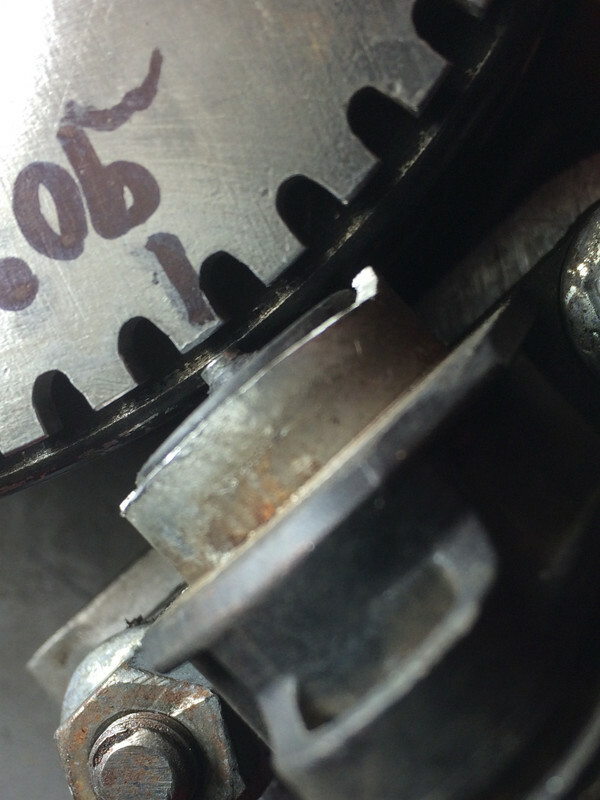 does the gap between the trigger wheel and the sensor remain constant while turning the crank? Last edited by Wagner; 04-03-2016 at 04:55 AM.. I'm hesitant about saying this, because this is based on memory, and could very well be all wrong: i seem to remember, that the end of the long tooth in a stock Volvo LH2.4 flywheel is at 84 degrees before top dead center. So in other words, first find TDC. Then turn the engine backwards 84 degrees. Then your sensor tip should be at the ending edge of the section with no holes in it. But that is really just based on memory. I have no way of verifying that right now. A picture of the stock system with engine at TDC would be helpful here. EDIT: It appears that the Volvo manuals state, that the ECU determines TDC to be 90 degrees after the passage of the long tooth. 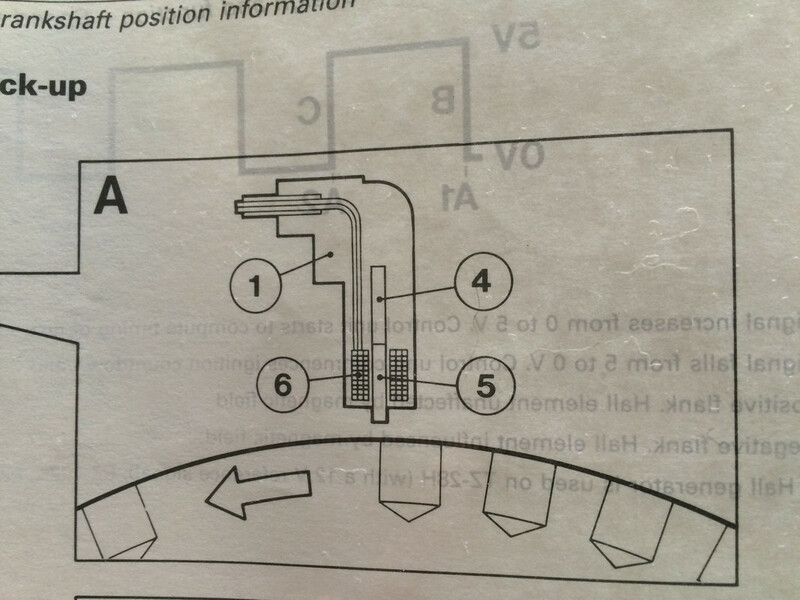 So that would mean, that first finding TDC, then turning engine 90 degrees backwards, and then adjusting your trigger wheel so that the sensor tip is at the ending edge of the long tooth, should set your system up as stated on Volvo literature. This is what I originally based my setting on (tip of CPS on trailing edge) - but since it didn't try to catch, I moved it CW to the center of the gap. However, that was with the incorrect tooth filler and a wider air gap overall, so I need to go back & try it again, setting the pickup to the edge of the tooth. Since mine is currently centered in the gap, I will first retry moving the trigger wheel CCW to get it centered over the trailing edge of the long tooth. To answer your other question, the trigger wheel is not perfectly concentric (due to variations in slots for adjustment) - the air gap does vary, with the acceptable range, but still. I have tried to maneuver it to get the minimum gap as even as possible, but I would say it still fluctuates from .025 - .039" (Volvo design allows for .020" - .059", but that may still mean steady gap - I would expect they would allow for engine component wear, though?) I think I will remove it & file the adjustment slots to allow closer radial adjustment, if it doesn't improve simply by resetting the tooth / CPS positioning. I do have a nice steady pulse now, checking with a timing light, so I don't know that there is an issue with signal strength at this point? I have the dist. rotor centered & #1 position - given that the system primarily deals with advance, I can rotate the dist CCW to make sure I have more rotor contact for the advance end. 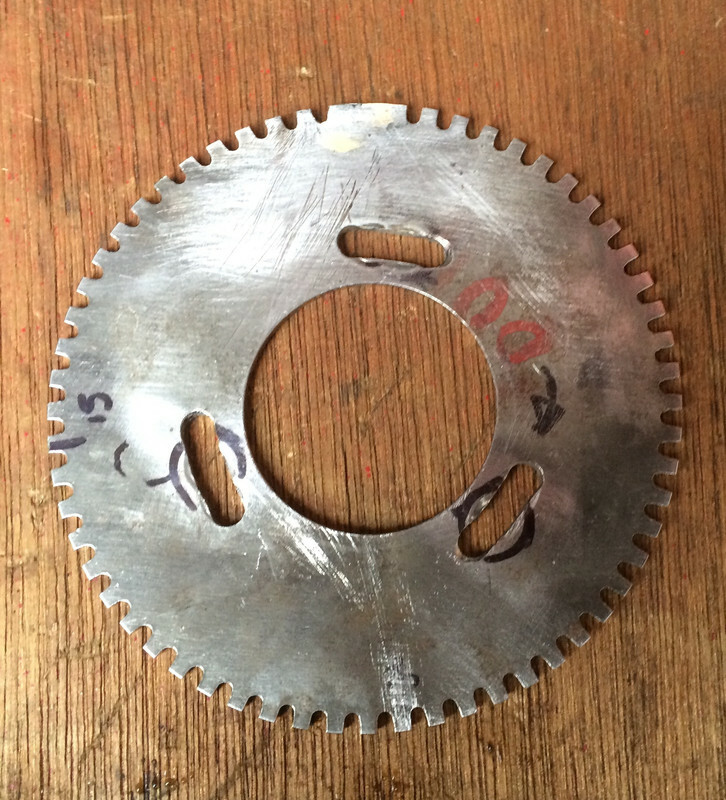 The rotor (1389425) for LH has a very broad contact blade. I don't think this will matter right now in terms of just starting & idling though. Last edited by lookforjoe; 05-31-2018 at 08:30 PM.. I think it would be safe to say that it does not matter at this point. The difference between having the sensor tip just before the edge, right at the edge and right after the edge is probably at most 1 degree. That amount will not matter at all on getting the engine running. It will only affect ignition advance slightly. Not enough to prevent it from starting or running. Variation of the air gap results in variation of the signal level. VR sensor signal is very dependant of the sensor distance. If the engine does run, then it would seem to be within the acceptable tolerancies though. Ok - it's alive. Bad news is timing feels all wrong - and/or way too lean at part throttle. Definitely runs too lean under part throttle according to my WB02. Need to disconnect the O2 & see what my base AFR is- running 18.25lb injectors and 50psi base fuel pressure (so closer to 20lb). Volvo 960 3" TB. Bosch WR7DC+ @ .028" gap. My motor is only 1600cc, but longer duration / higher lift can, big valve head & 10.7:1 compression. I tried fiddling with the trigger wheel relative to TDC - half tooth advanced, half tooth retarded), but can't say it altered anything. Looks like base timing is around 12-14BTDC - hard to tell exactly as the markers are not in a position where you can get a straight view at them. Air gap is good at about .024" - I removed the wheel and cleaned up the slots so I could better center the wheel radially. Tried a couple different EZK (3531325, 3517402) modules, and a 6842115 and 3515407 LH ECU - didn't change the timing / lean condition. The nice thing about running more base timing is the motor idles at a lower temp - I used to sit at higher coolant temps with the LH2.2 - I couldn't run more than about 6 BTDC with that setup & not get knock at any load. Wondering if I should swap out the 3517020 MAF for a 760 one. Before I start messing with chipping the ECU's I'd like to see it run reasonably in stock hardware, but maybe that's not possible..
Last edited by lookforjoe; 06-02-2018 at 09:20 PM.. Tried this. Actually runs quite well. I tried jacking the fuel pressure to 70psi with the 18.25Lb'ers, and it wasn't happy at all. With the 012 MAF, and 30Lb ...759 Red injectors (V70 LPT '98) and fuel pressure dropped back to 45psi base it seems quite happy, feels much better & fuel AFR's are more reasonable under load. Idle O2 sweep is pretty decent. Base timing is now closer to 12ºBTDC - I moved the trigger wheel to center over the 15th tooth, so the 90º after long tooth comes up a hair after TDC, retarding the base timing a couple degrees. Slight funkiness with off throttle & decel feel with the 012 MAF, think that was also discussed as a by-product. Does have some knock under load - I expect due to the load resolution shift that has been discussed with the 012 MAF. I tried grounding pin 18 for 3º retard, and that wasn't enough. I'll try pin 19 for 6º & see how that goes tomorrow. I will also try running higher fuel pressure to drop the AFR under load - see if that helps with the knock. 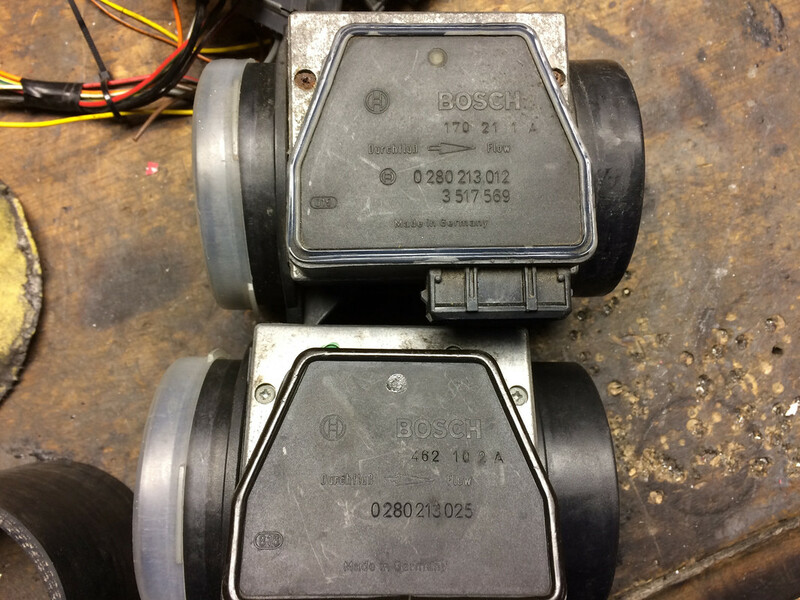 I ordered a set of reman Bosch 832's - 24lb - so I can try those with the stock MAF, since that will resolve the timing advance issue with the larger MAF. Going to try running a Turbo EZK bin, see how it runs with that also. Last edited by lookforjoe; 05-31-2018 at 08:34 PM.. Cold start with the 012 MAF is not great. Very rich. Still has knock even with 19 grounded. Tried raising base FP to 50psi, no change in knock reduction at part load. Installed the stock MAF with the 30lb inj. & lowered base FP to 40psi. Runs well enough, no audible knock under load ,AFR's are fine at idle & part load, but too rich under heavy accel (12's & richer). O2 sweep at idle is good. I'll see how it is from a cold start. Probably could just drive it as is, but I don't think running that rich (11's) is a good idea under heavier load. I think running 24lb injectors with the stock MAF will bring the part load & up AFR's into reasonable range. I'll know in a few days. I had wanted to burn a turbo EZK bin to try, but I'm not sure which bin to use - the 0227-400-208_2227355740_EZK116 ? have you disabled o2 feedback in the lh ecu yet? If you're going to be fairly serious about tuning it, you'll want to do that at least while you get things sorted out. edit: NA. yeah, rich, but still not that bad for getting started tuning. I probably wouldn't run it like that forever, but it's not likely to wash things down in 5 minutes either. Haven't done any tuning yet - only just figured out how to get the driver installed for my willem programmer - I need to extract the 95x bin from my ECU - I can only find 93x bins online. I have TunerPro RT, as I used it for my M4.4 tuning. With the 3barFP/30lb/016 MAF the base mix is way too rich - cold start I'm in low 11's - so disabling Lambda will put me right in that range I'm sure. I'm going to get the 24lb in & see what the baseline is. I'll start tuning from that window - which should be well within the adaptive range for starters. If you go to jetronic info you should be able to just pick up the stock rom. You can 'back date' to the 937 bin or update to one of the 96x bins as well on the 95x ecu. Found the 951 bin and xdf from jay breeze. Wondering how to determine values to enter for rescaling injector constant for the larger injectors? Anyone have experience with that? Last edited by lookforjoe; 06-02-2018 at 09:22 PM..